Carving pumpkins is one of the few Halloween crafts that I get really excited about. It's fun, it's family-friendly, and it's a great way to play with artistic ideas. I guess there's nothing like Halloween to bring out the sculptor in us all. Here's a few I've come up with. Give them a try, or create your own: it's all in good fun. Indian Medallion Pumpkin Inspired by Indian block print fabric, the medallion on this pumpkin is easy to carve freehand with just a linoleum cutter. As always, no pattern required. Monogrammed Pumpkin We monogram sheets and sweaters, why not pumpkins? Give Halloween a typographical twist and personalize a pumpkin for yourself or a friend with this easy, freehand technique. Once your pumpkin is carved and ready, you may want to take simple steps to preserve it for the big day. Check out the tutorial, "How To Carve A Pumpkin" for tips and tricks. 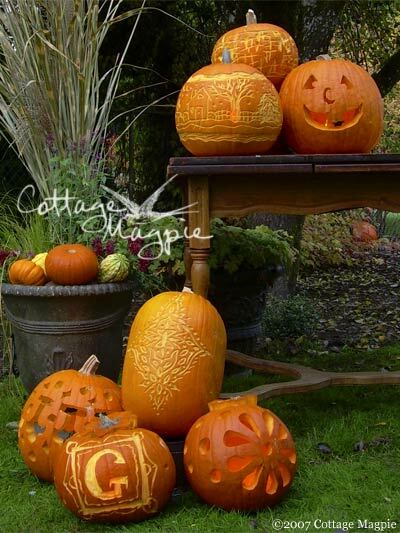 And if you try out any of these pumpkin ideas or have great ideas of your own, please, let me know!